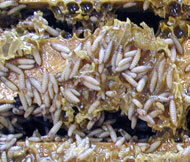 Honey bees may be affected by a range of pests and diseases. The list below contains information about specific pests and diseases from a collection of sources, as well as regulatory information and forms. Calling the Exotic Plant Pest Hotline on 1800 084 881. To report other non emergency biosecurity risks, use the online form form. A number of animal diseases, including all emergency animal diseases, are notifiable under NSW legislation. This means there's a legal obligation to notify authorities if you know or suspect that an animal has one of these diseases. The two day course provides beekeepers with the skills to recognise, monitor and manage the impact of pests and disease on commercial honey bee colonies.